What’s The Design Sprint 2.0? There are many different methodologies that help designers be more productive and efficient. One of the most popular frameworks that’s heavily focused on teamwork and collaboration with the client is the Design Sprint. It was developed by Jake Knapp and covered in his best-selling book Sprint. To learn more about design sprints and the latest approach to them, we reached out to AJ&Smart. 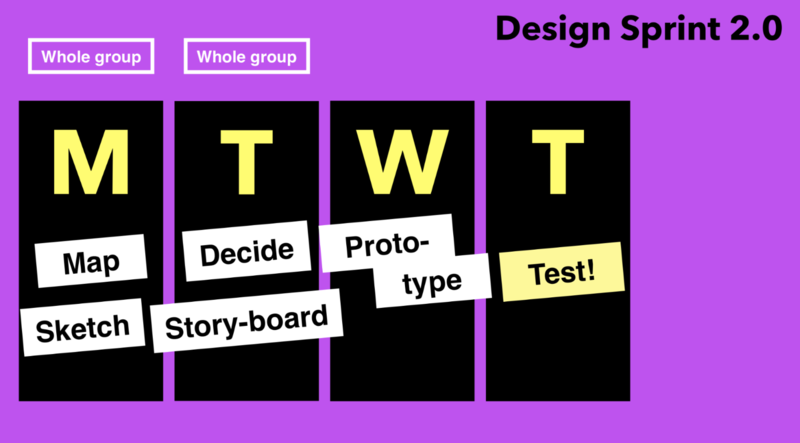 They’re a Berlin-based product design studio that specialises in the Design Sprint and work closely with Jake Knapp, and who recently came out with something called the Design Sprint 2.0. We talked with Brittni Bowering, Head of Media at AJ&Smart, who through her time at AJ&Smart has become somewhat of an expert in Design Sprints. One more thing before we jump into the article – if you’re more of a podcast type of person, then we’re excited to announce our first-ever audio interview, which is a recording of our conversation with Brittni, is available now. It’s worth checking out. We spent an hour sitting in a hot room with +30°C (86°F) heat outside (Berlin doesn’t know what AC is), but it didn’t stop us from having a great talk! Brittni herself is responsible for teaching people about what AJ&Smart is doing, which often runs Design Sprints for clients — clients among whom you’ll find everyone from Fortune 500 companies, to Silicon Valley tech giants, to young startups. Design Sprints allow you to gather key decision makers in one room: from the CEO, to salespeople, marketers, and designers, and really make things happen in just 4 days. What is the Design Sprint… 2.0? 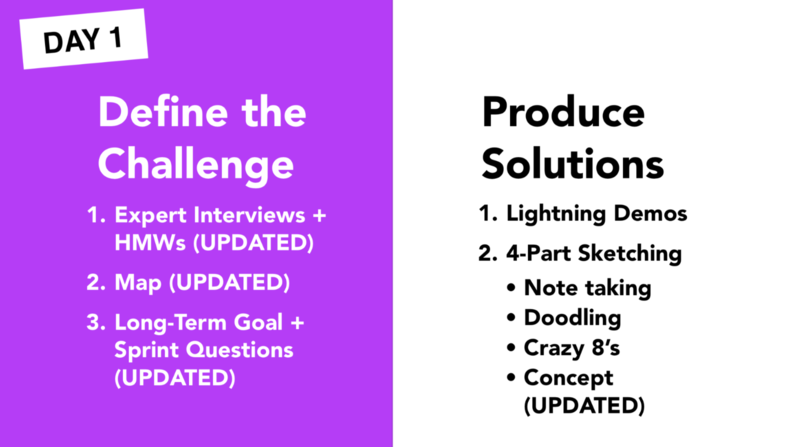 As mentioned before, AJ&Smart have updated the original Design Sprint framework based on their learnings from running Sprints with clients for a couple of years, and where they saw parts of the Sprint that could be condensed and more efficient. For a while now they’ve been 100% focused on running Design Sprints, a move they made because they saw the effectiveness of the method. They named their new framework the Design Sprint 2.0. So, what’s different from the original framework? By merging exercises from Day 1 and Day 2 into just Day 1, AJ&Smart made the full Sprint take 4 days instead of 5. This way they have time to reflect on sprints on Friday. There are more differences, which we will find out about now — let’s jump in! The Design Sprint 2.0 starts with Expert Interviews, where the experts are people familiar with the product on the client’s side. They differ a lot depending on who the client is and the objective of the Sprint. Sprint participants are opening a dialog about the challenges that the client is facing. During the interviews, the participants are writing How Might We statements on Post-It notes. Then there is a voting on the best of those statements. Then, with one statement chosen, participants are defining a goal of the sprint. That’s also something that’s a bit different in Design Sprint 2.0. AJ&Smart call it the Two Year Goal. Instead of setting a goal just for a sprint, people involved propose what would be the perfect outcome of their work in two years. It’s not about being realistic or measurable. It’s a North Star. It’s about having a vision, about what this sprint is supposed to do. After that, everyone votes for the best idea and the final goal is chosen by a Decider – a person who is in charge of making decisions throughout the Sprint. At this stage the team also challenges the goal. They’re encouraged to be a little pessimistic, and ask themselves: what could stop us from getting to that goal? Those concerns are then turned into questions. So if the concern is that the competition is fierce and the team are worried that this could stop them reaching the goal, the can we question might be can we create something that’s so special that it puts us in a different playing field than the competition? The map exercise, which is next, was originally really time-consuming and involved a lot of unnecessary discussions. The goal of the Map exercise is simply to find a target area of the Sprint, and it doesn’t need to be perfect, so AJ&Smart reduced it to 45 min. Same with Expert Interviews, which used to take hours – they take 1.5h in the updated framework. Next is the Lightning Demos exercise, which are sessions of rapid research of the industry. Everyone is looking for inspiration at that stage. It doesn’t have to be industry-specific and participants can find inspiration from anywhere they wish. Monday’s last exercise is Sketching, which used to be a part of Day 2. It’s about having raw ideas for things that are going to be prototyped during the sprint. Also, it’s done in an old-school way – no Macs or iPads are allowed. This part of the process is to actually get our hands dirty. Day 2 in the Design Sprint 2.0 is all about the decisions on what to prototype. In the book, it happens on Day 3, but remember we’ve saved a whole day of work by doing the Map and Sketch exercises on Monday. There are many voting steps at the start of Day 2, but the final call is still on the Decider. Of course, the final decision is highly influenced by other people’s opinions and the Decider is encouraged (by the exercises and the facilitator of the Sprint) to take the team’s thoughts into consideration. It does sometimes happen that a Decider takes a decision against what everybody else wants. Even if other Sprint participants believe the Sprint is going down the wrong path, reassurance comes from knowing that the solution will be tested with real users to see if it works out. The first step of choosing the right thing to prototype is the Heat Map exercise, during which people vote on the most interesting sketches prepared the day before. This creates clusters of sketches, that are next highlighted in the solution presentations. After this, everyone votes for the best idea to be developed. 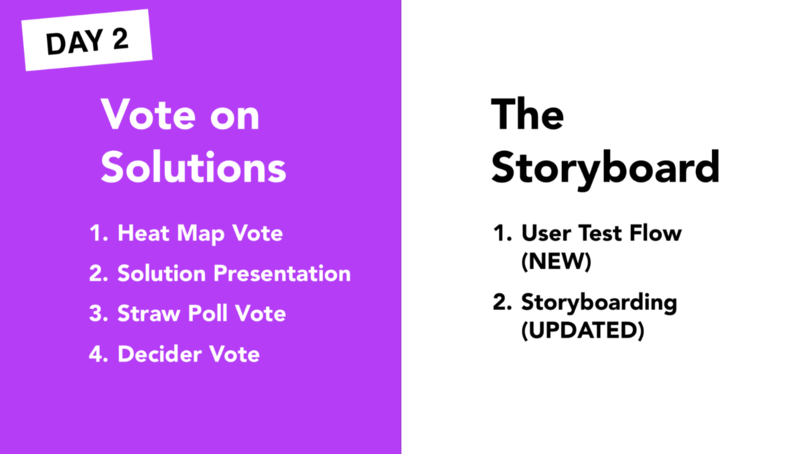 Storyboarding is next, and it was also reworked slightly for the Design Sprint 2.0. AJ&Smart came up with a short exercise (called User Test Flow) where they use 6 Post-Its to write one step of the user’s ideal journey on each. After putting these steps on a wall in the correct order, there is another voting session, and the Decider chooses the flow they think is best. This change in process reduces the time for this exercise from 3-4h just to 2h. The next day is all about prototyping. The goal here is to make those prototypes as high-fidelity as possible so that the user testers would feel like they’re using a real product (or as close to one as possible). During this day there are two check-ins with the client to keep them in the loop. 5:00PM is the cut-off point, after that milestone no new screens are created, and everything is just getting stitched together. The Design Sprint 2.0 is wrapped up on Day 4 with ➡️ user-testing. AJ&Smart uses a variety of techniques to recruit suitable users, for example targeted Facebook Ads, and leveraging their personal network. Each person who shows interest in participating is screened to make sure they’re the right candidate, and all participants get rewarded with Amazon vouchers for their participation. AJ&Smart always schedules 5 testers + 1 extra, just in case someone doesn’t show up. It’s scientifically proven that after 3 tests with a product, you’ll start seeing very similar answers. After interviewing 5 users, you start seeing where you’ve gone right and where your assumptions were wrong. The first test happens 10:00-11:00AM. After that, there’s a buffer time to fix little inconsistencies that came up, and the rest of the tests then follow. Questions asked during those interviews are based on the Sprint questions that were set earlier. The best practice is to ask open questions and get people talking. And that’s Brittni’s best advice for testing too – get them talking. Ask their open opinions about what they’re seeing, what they think should happen next, and their experiences. If this product was the most perfect product you’d ever used, a life-changing product, what would it need to have? What would make it the best? Also, it’s very important to keep testers relaxed. Ask them about their day, what they do for work, just to make them feel comfortable and at ease before you kick off the user test. They’ll give you the most value when they feel at ease with you. After the testing day, we’re left with a wall full of feedback Post-Its – positive feedback in one color, negative on another, and all categorized by certain features. That feedback is used to create suggestions presented later to the client in the form of an Effort – Impact list, which is basically a recommendations roadmap of suggested features to work on. Would it be possible to achieve similar results not using Design Sprint methodology? Brittni believes that the it could be possible , but it wouldn’t be nearly as fast and efficient. Another important thing is that Design Sprints bring the team together and it’s great for collaboration. It makes work way more effective and enjoyable for everyone involved. What’s the future of Design Sprints? Design Sprints let teams accomplish what could have been 6 months of work in just one week. The goal now is to introduce Design Sprints as many people and teams as possible, and that’s what Brittni is busy doing. For more about Design Sprint 2.0, check out AJ&Smart YouTube channel. You can also check their Design Sprint Masterclass and join a free 1.5 hour Design Sprint webclass. And feel free to follow Brittni on Instagram! AJ&Smart also run a Facebook Group, Innovation Hackers, that’s all about innovation and Design Sprints.